Industrial design tantalises the eyes with a mix of refinement and edginess, and of urban and earthy. Easily create this look with a combination of woods and metals. Imagine suspended stairs with thick and strong wooden treads paired with metal handrails and balustrades, coated in black paint. You can also consider strong black stairs, purely made of metal, against a red brick wall background or stairs with timber balustrades of uneven height, donning a raw natural finish. Modern industrial décor is characterised by open spaces and leans towards minimalist design. You can achieve this look with the trending open-riser stairs, using metals and woods. Placed where natural light streams through, having stairs with open risers creates a dramatic play of light and gives the illusion of an even larger space. For closed spaces, hanging a row of pendant lights from a bare concrete ceiling adds a touch of the rustic and creates an additional safety feature. Industrial interior design gives a structure a raw, edgy look, benefitting establishments aiming for a modern look. The sturdiness and simple elegance of industrial-themed stairs make them easy to maintain and accessorise with utilitarian objects. 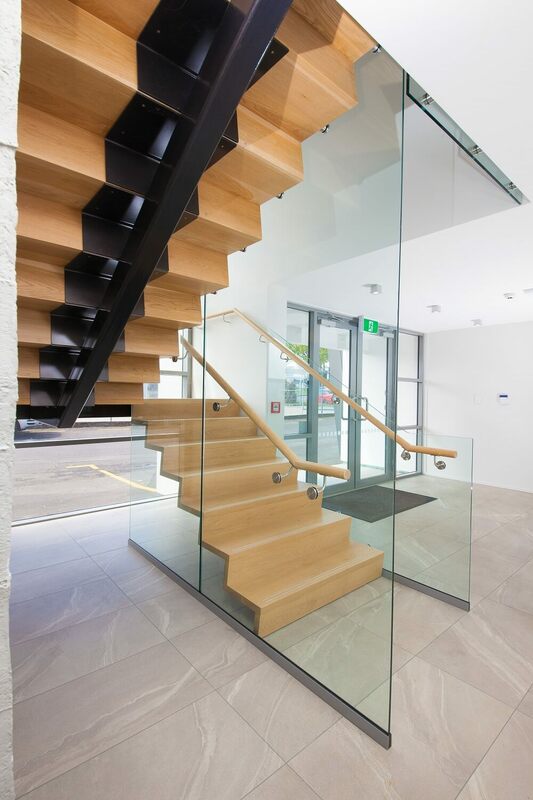 At Ackworth House, we combine modern elegance and practical function to provide our clients with commercial building stairs that add value to their establishment. If you want an industrial-themed staircase, we can custom create stairs that match your interiors and are compliant with building code requirements. Call us on 0800 ACKWORTH for more details or view our galleries for design ideas.